Our staff are certified Personal Support Worker’s or equivalent. They are trained to assist with bathing, dressing, skin care, toileting and general grooming. We know something as simple as feeling clean and fresh can make such a difference to the day. If you are looking for someone to just come spend some time with yourself or a family member, our caregivers are more then willing. 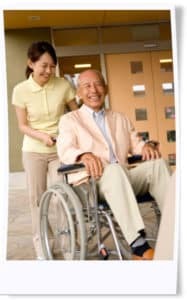 If you often visit a family member in a hospital but for some reason cannot go but do not want to leave them alone, we can send a caregiver in to keep them company while you are away. Our caregivers are qualified to assist with feeding. Mealtime can often be a challenge and our caregivers have the patience and understanding necessary to take as much time as a client needs to enjoy a meal. Our caregivers can pick up a few items as part of their visit. It’s those little extras that are important to you and can often make a hospital visit much easier. Our caregivers stay with your loved one overnight and they remain awake and attentive to their needs. Whether it’s for safety, personal care and/or comfort, having someone there can let you rest easier.